From its beginning, Alan Moore’s Promethea has been hailed as something special in the comics world. Readers admired the strong female characters and tight writing; critics heaped praise on J.H. Williams’ innovative layouts; comic book artist and writer Trina Robbins even wrote in to gushingly call Promethea “what Wonder Woman should be if she hadn’t been destroyed by generations of idiots” (“Imaginary Lines,” Promethea #3). Starting with issue #14, however, Promethea took a sudden turn that threw many fans for a loop and caused the comic’s circulation to drop substantially. The ten-issue story arc trades plot for philosophy as Sophie sets off on a “kabbalistic road trip.” Each issue is devoted to one sephira on the Tree of Life, a glyph dating from the late medieval period that serves as a map of creation in Jewish mysticism (link). Previous story arcs had also had an educational aspect, the superhero story doubling as a primer in ceremonial magick. For many readers, however, the kabbalistic issues simply fell too far outside of their expectations for what a superhero comic should deliver – a plot-oriented, action-packed tale of adventure. One might argue that this kind of reader reaction was predictable. Comic books carry an adolescent stigma in our culture, and readers have corresponding assumptions about what will be asked of them as an audience. Most readers don’t expect to be required to stare long and carefully at each individual page, to struggle with abstract existential concepts, or to go entire issues where the only plot events are internal to the character’s minds. A skeptic might suggest that to try to tell this kind of story in the comic book medium was an effort doomed to failure. I would disagree with this assertion wholeheartedly, and suggest in contrast that the comic book is the only medium that could have communicated Moore’s vision with such power. Although comics have long been dismissed as children’s literature and are only beginning to come into their own as a mature art form, comics are actually a subgenre of sequential art, a form of visual storytelling that has a long and rich history. As Scott McCloud explains in Understanding Comics, sequential art has been used to tell stories for centuries. McCloud’s book includes renderings of medieval French and ancient Egyptian narrative art (10-14), as well as several panels from a 36-foot long pre-Columbian picture manuscript, which narrates the history of the political and military hero “8-Deer Tiger’s Claw.” Aquired by the conquistador Cortés in 1519, the manuscript tells of military conquests, cunning battle stratagems, and gladiatorial combat, and ends in the ultimate victory of the hero. Similar examples of such sequential art can be found around the world, from figures inscribed on ancient Greek urns to illustrated medieval Japanese scrolls. McCloud also notes that comic-like forms have been used for religious art in the past. One illustration reproduces a series of scenes entitled “The Tortures of Saint Erasmus,” a bloody late medieval work portraying the sufferings of a Christian martyr (16). Although this work might be off-putting to our modern tastes, it serves the same purpose in miniature as the great stained glass windows of European cathedrals do, with their scenes of the life of Christ and the acts of apostles and saints. Such works educated and instructed medieval worshippers, many of whom were illiterate, but who were fully capable of understanding the meaning of a picture. At times, however, these works must have served more than simply an educational purpose. The soaring architecture, heavy incense, solemn liturgy, and vast political and ecclesiastical power of medieval cathedrals would have combined to instill a sense of awe and divine presence in worshippers, most of whom were not wealthy and were unused to such splendor. The religious stories captured in the stained-glass images would have been contemplated in a sacred environment that was distinctly set apart from everyday life. One can imagine how a medieval townsperson, listening to the mysterious strains of the Latin mass while gazing at these religious images, might easily have been moved to a powerful religious experience. I believe Promethea may be properly considered as a descendent of this kind of religious art: art that can function to inspire spiritual experiences as well as instruct. Although Moore cannot create in a comic book the kind of multisensory input that a worshipper in a medieval cathedral had, the kabbalistic issues of Promethea combine word and image in an intensely experiential way. Each issue, through specialized color palette, unusual layouts, and precisely crafted dialogue and imagery, invites the reader to do more than simply read the book. The sephiroth (spheres on the Tree of Life) are brought to life through form that matches content – visual puzzles, word games, and shades of orange convey the intellectual sphere of Hod (link); blue-greens, flowing lines, bubbles, and an ocean setting portray the emotional sphere of Netzach (link). As Sophie travels through these various levels of consciousness, the reader is encouraged to do the same – to contemplate each page slowly, immersing him- or herself in the complex play of images, words, and colors that capture each issue’s unique state of mind. Although these issues tell a story as well as attempt to educate, they also serve the unusual purpose of being meditational tools, triggers for altered states of consciousness. As he told Comic Book Artist in an interview published in June 2003, Moore wrote many of these issues in a state of ritual meditation. In order to describe each of the kabbalistic states of consciousness that Sophie and Barbara would explore, he sought to achieve them, and to produce his art as an _expression of that state. “What you were seeing in the comic is not the report of the magical experience,” he told CBA. “It was the magical experience” (41). This ambition of this project – to produce comic books that are expressions of spiritual experiences, and which in turn provide the reader opportunities for similar spiritual experiences – makes it clear why, for so many comic book readers, the kabbalistic issues of Promethea were almost unreadable. While most readers are accustomed to reading comics for fast-moving plot and broadly drawn characters, these issues require slow meditation and immersion in the art. Sophie’s kabbalistic journey does have the potential to entertain. The issues simply don’t work, however, if we hold them at arm’s length the way we often do with our entertainment, allowing it to divert us for a little while but not to change what or how we think. Yet despite the fact that the adolescent reputation of comics makes Promethea difficult for some readers to appreciate, the comics medium is ideal for this material. Though as adults, we no longer need our stories to come with pictures in order to understand them, the emotional impact of visual art touches us on a deeper level. Something about the primal wordlessness of images speaks to our subconscious as well as our conscious minds. As McCloud points out, we sense uncertainty and tension from a cramped, unsteady line just as we sense organization and rationality from clean lines and right angles (125). Pictures can therefore subtly show what words are only able to describe. By combining a verbal message with complimentary images in a style of art that evokes and reinforces the same message, multi-level communication becomes possible. 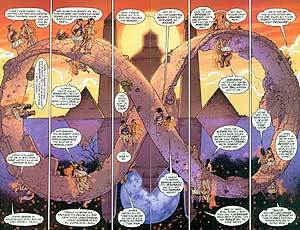 In Promethea, the visual is combined with the linguistic in a way that makes the abstract philosophy of the Kabbalah satisfyingly concrete: Moore’s recursive meditations on the intellectual sphere of Hod are given form as the characters loop endlessly around a Mobius strip shaped like the sign of infinity (link); the harsh severity of Geburah is rendered entirely in red and black and communicated in heavy lines and deep shadows (link); the shining sphere of Kether, the source of creation, is printed in gold on white, the words of the characters’ dialogue fading in slowly as if they were only just coming into being (link). Though occultists have written dozens of books attempting to characterize the states of consciousness that make up the Tree of Life, only Moore has realized them so tangibly, transforming them from dry correspondence tables correlating colors, smells, and personality traits, to living environments open to anyone with eyes to see. As with worship services in medieval cathedrals, the use of multiple kinds of communication (both visual and linguistic) makes possible experiences of an intensity that may be difficult to achieve otherwise. 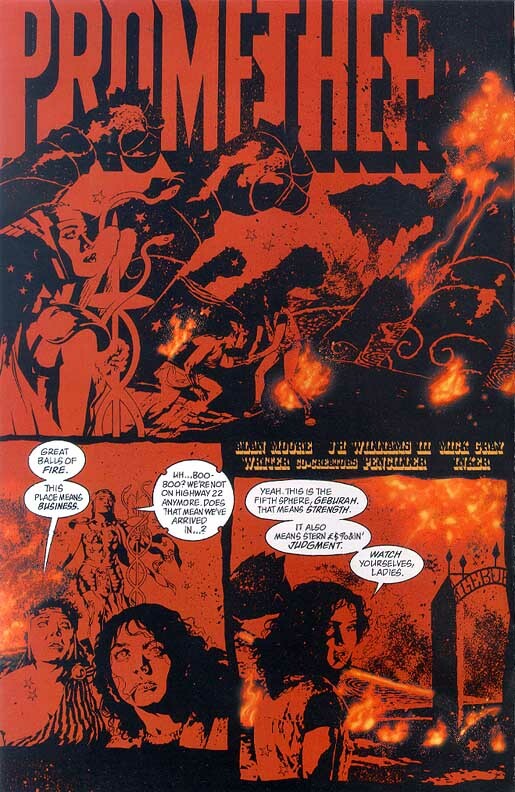 Promethea is a challenging work, one that demands a certain amount of surrender from the reader: the willingness to be moved to tears by the turbulent emotions of Netzach; to feel anger pulsing through the red-and-black heat of Geburah; to embrace the reason-defying paradox of dark Binah, the goddess who is both Virgin and Whore. Moore has clearly done his best to pour whatever spiritual insight he may have found into this work, but like all good art, there are far more nuances hidden in the panels than the ones he and his colleagues put in deliberately. Although these issues may successfully serve as spiritual triggers for the reader, occasioning flashes of insight or even profound moments of revelation, in the end Promethea merely gives back to the reader whatever he or she is willing to put in. I intend this essay as a call to both new and old readers of Promethea, to put aside their expectations for what a comic book should be. As a medium, comics have been stunted by our cultural assumption that they are merely art for children and adolescents. Today, we are still learning what particular strengths comics will have as a mature art form. In Promethea, Alan Moore pays homage to the superhero comics that defined the medium in the past, while in all other ways pushing the envelope on what comics might yet be. Can a comic book also be a profound spiritual text? Read for yourself and see! McCloud, Scott. Understanding Comics: The Invisible Art. Kitchen Sink Press, 1993. Moore, Alan. Interview with Jon B. Cooke and George Khoury. Comic Book Artist No. 25 (June 2003). Robbins, Trina. Letter to Alan Moore. “Imaginary Lines,” Promethea #3 (October 1999). Thanks to Eroom Nala’s Promethea annotations for providing the illustrations for this essay. Christine Hoff Kraemer is a Ph.D. candidate in Religion and Literature at Boston University. For more of her writing, please see her website at http://inhumandecency.org/christine.